South Park, 1853: San Francisco's first planned development, looking southwest from 2nd Street (Rincon Hill), Twin Peaks and Mt. Davidson in background. Built by capitalist George Gordon shortly after the gold rush, South Park was designed by George H. Goddard, Esq., an Englishman, and featured several lavish mansions around an "orchard." According to historian Albert Shumate, who assembled the book South Park and Rincon Hill (Windgate Press), the oval shape was part of what was known as the "English Crescent Design," and was intended to promote neighborliness. 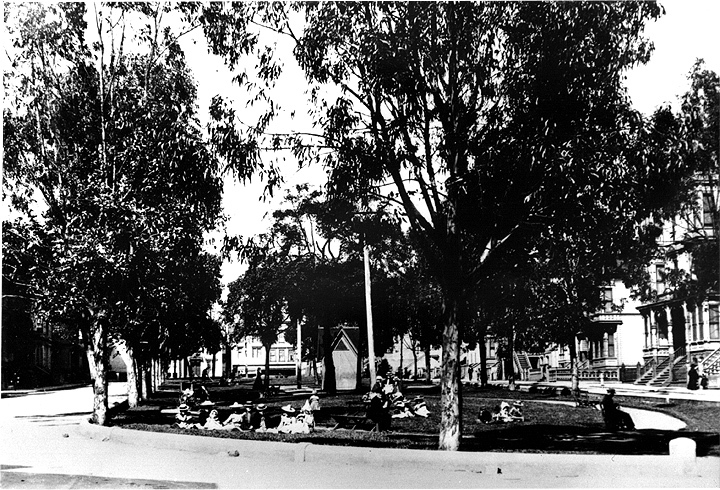 Forty years later in the 1890s South Park had become a pleasant but forgotten urban park.